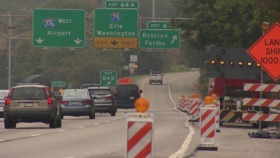 PennDOT is announcing a full weekend closure of inbound (eastbound) I-376 (Parkway West) in Scott Township and Rosslyn Farms, Carnegie and Greentree boroughs, Allegheny County, will occur Friday night, April 17 through Monday morning, April 20 weather permitting. Crews from the Swank Construction Company will conduct paving operations on inbound (eastbound) I-376 beginning at 10 p.m. Friday night continuously through Monday morning at 6 a.m. Inbound I-376 will be closed to traffic between the I-79 (Exit 64A) and the Parkway Center (Exit 68) interchanges. The paving operation is weather dependent. If inclement weather occurs crews will conduct pipe replacement during the weekend closure. All inbound traffic will be detoured. Police will control traffic at key intersections along the detour route. Outbound (westbound) I-376 between the Greentree/Crafton (Exit 67) and I-79 (Exit 64A) interchanges. A total of 6 weekend closures will be implemented for paving operations. Full eastbound (inbound) closure from 10 p.m. to 6 a.m.
Single-lane restriction westbound (outbound) from two hours after the end of the Pirate game to 6 a.m.
Full westbound (outbound) closure from 10 p.m. to 6 a.m.
Single-lane restriction eastbound (inbound) from 10 p.m. to 6 a.m. The westbound (outbound) closures will occur between the Greentree/Crafton (Exit 67) and I-79 (Exit 64A) interchanges. The eastbound (inbound) closures will occur between I-79 (Exit 64A) and Parkway Center (Exit 68) interchanges. The detour route is listed above. Crews will conduct barrier replacement, shoulder reconstruction and bridge rehabilitation work. Additionally, work will occur on structures at the Poplar Street and Banksville Road interchanges. Motorists should allow extra time if traveling through the corridor. Additionally, motorists should be aware of shifting and narrowing lanes. Please use caution and slow down through the construction area. Work zone safety is everyone’s responsibility.